Dehydrating food is an excellent way to preserve your food, build your own pantry, cut down on your food bill, and up your preparedness level. 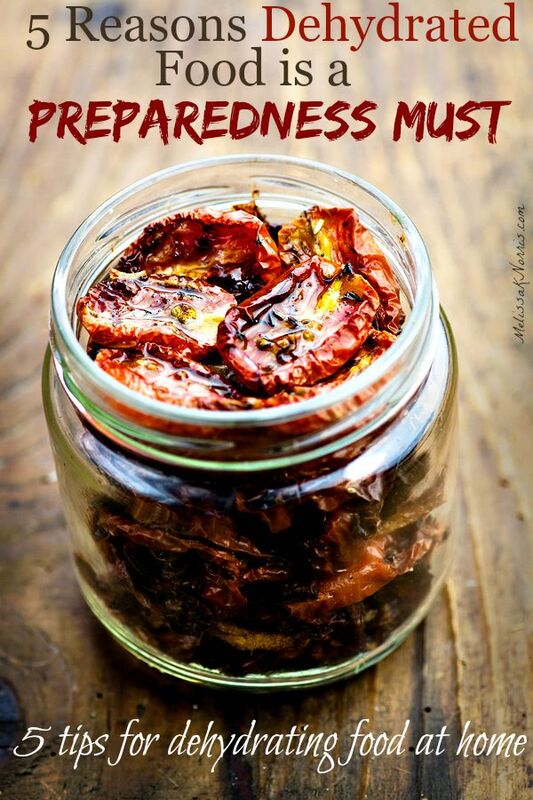 In fact, dehydrating could be called the prepper and survivalists top food preservation mode. Removing the moisture from food allows it to store indefinitely in proper conditions, making it a preferable choice for the preparedness minded individual. Smoking is another form of dehydrating food and creates delicious meats and cheeses, as well as preserving them. Learn how to smoke cheese at home here. 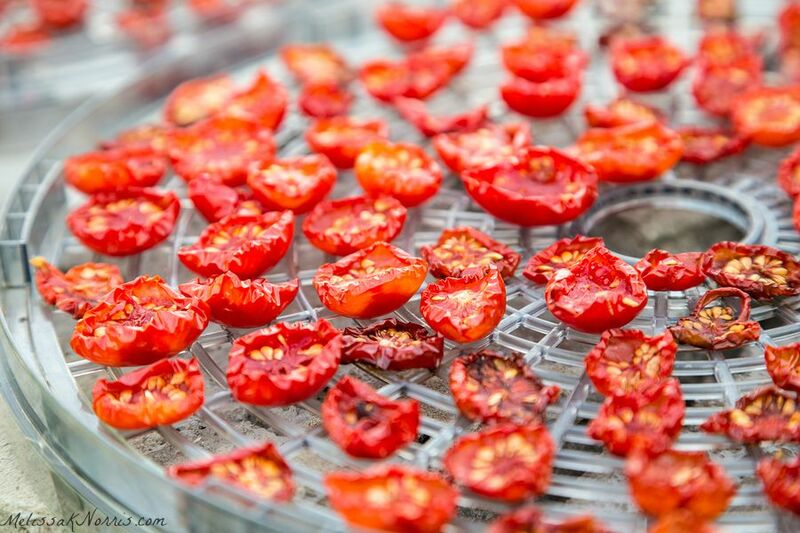 Dehydrating allows you to harvest your food in season and preserve it for year round eating. From foraging, to harvesting from your garden, or even purchasing food in season, dehydrating lets you build your own food supply for year round use. Note: Dehydrating or freezing is the only safe way to preserve wild mushrooms as canning is not recommended for wild mushrooms. One of the beauties of dehydrating food is its portability and ease of storage. When all of the moisture is removed from the food, it shrinks up considerably. This is done either through salt or the movement of cold or hot air through the food. Because organisms that cause food spoilage need moisture to grow, dehydrating them makes the food a perfect candidate for long term food storage. Plus, unlike a freezer, dehydrated food requires no electricity to maintain its stability. Check out this, when dehydrated, one pound of fresh apples becomes just two ounces. Each food will vary on the how much it shrinks down, but you can see why dehydrated food quickly becomes essential when you’re on the go or for bug out bags. Some dehydrated foods needs water for reconstitution, but many items can be eaten as is, which is ideal in emergency situations. Fruit leather, strawberries, grapes, blueberries, apples, peaches, pears, bananas, pineapple, and zucchini chips are all easily eaten without reconstitution or the need to soak in water. Plus, they’re quite delicious and packed with nutrients. While I love home canned food for many reasons, you can’t beat dehydrated food for the ease of carrying or storage. From meals on the go, to hiking and camping, in your emergency bag (11 Things You Need Ready All the Time) or extended times in the wilderness, you can pack much more dehydrated food than any other form. Dehydrated food requires no refrigeration and very little storage space. It can easily fit in backpacks, purses, or pockets. Drying food is one of the old traditional methods of food preservation known to man. In hot climates, food can be dehydrated simply by laying it out in the sun on a screen or rack. A solar Sun Oven (which I’m so grateful Sun Oven sent to me in exchange for my review, because I was skeptical of it working in the Pacific Northwest where sun isn’t something we have a lot of, but it is quickly become my new favorite toy) is also an off-grid dehydrator! Frugal dehydrator–> Nesco Dehydrator It’s 42% off at the time of this posting!! I purchased this dehydrator two years ago when my garage sale one bit the dust and have been very happy with it. For optimal long term storage, dehydrated foods should be stored in a dark cool area in an air tight or vacuum sealed container. Pantry shelves or cupboards work well, but under beds or anywhere out of direct light is fine. The foods you can dehydrate are limitless, from fresh fruit, vegetables, herbs, to meat, and even liquid. You can make your own soup mixes, fruit leather, jerky, beans, onion and garlic powders, powdered cultures, to powdered eggs. Grab access to all of our free tutorials for dehydrating to build up your home food storage and sign up here! Canning tomatoes? Save the skins you’d normally discard and dehydrate them, then grind up into a tomato powder for use later in sauces and soups. There are many options for dehydrating your food from hanging meat on racks next to a warm outdoor fire for smoking, to racks indoors next to your wood stove, and in your oven if it goes down to 150 degrees. You can dry herbs by hanging them upside down in bunches in a dry warm area for about a week. When dehydrating your food, the biggest tip is to chop or slice all of your food as close to the same size as possible. The more uniform, the more they’ll dry at the same rate. An easy way to do this is to use a mandolin. Another option is a food chopper for items that need to be chopped or minced instead of sliced. Think about how you want to use the food before drying. If you’re drying apples, do you want apple rings to eat as snacks, or wedges to use in pies and desserts, or chunks to add to oatmeal? You might decide to dry some in all forms, but thinking it out ahead of time will be key. Place your food on the dehydrator trays. Make sure none of the food is touching one another. You want the air to be able to circulate all the way around each piece. Fruits don’t put off much odor, so you can dry different fruits at the same time. Strong odor items like onions and garlic should be dried by themselves or you’ll have onion flavored strawberries. Some folks will put their dehydrator outside or in the garage when drying onions and garlic if the smell is too strong. Select the appropriate setting on your dehydrator. Be sure to check on the food periodically throughout the drying time. You’ll want to rotate trays, especially if one tray is drying faster than the others. Use the manual times as a guideline as the time it takes to dry your food will vary upon your climate, how thick you cut the food, and how much water it had in it to begin with. For storage purposes, you can’t over dry your food. The drier, the longer it will store. Some people prefer their fruit to be dry but still flexible, while others prefer it on the crisper side. Once your food is dried to your liking, you’ll want to package it. You can place them in Mason jars and use a vacuum sealer attachment to make it air tight. You can use mylar or vacuum sealer bags. Another option is to double bag Ziploc bags and squeeze as much air out as possible. Be sure to always mark your containers with the date for proper food rotation in your pantry. To reconstitute vegetables, soak them for 10 minutes to 2 hours, but no longer, as they can start to spoil if soaked too long. They’ll return to almost fresh state and cook as you would regularly. 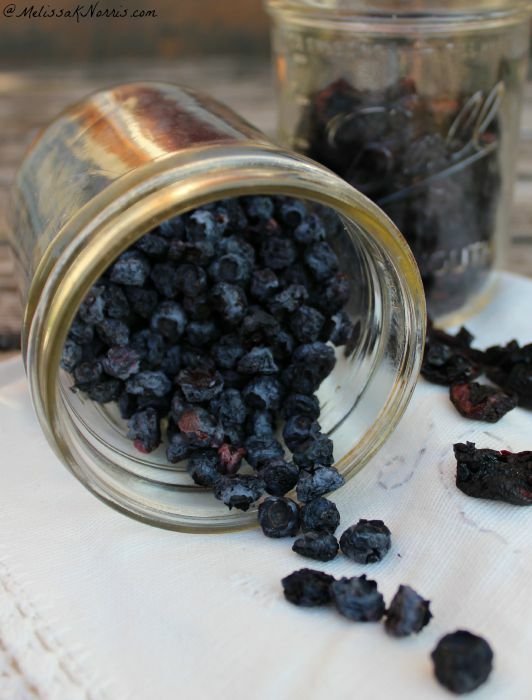 Want to save hours and days of drying time when dehydrating berries? Here’s our complete tutorial on How to Dehydrate Berries the Easy Way.